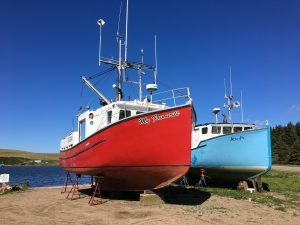 Just One More Mile – the story continues! But now we’re back with dreams of further traveling adventures and this latest blog is where you can follow those dreams! So grab a brew and join us as we begin another chapter! After the food excess of last night it was little surprise that I woke not in need of breakfast. But with clear blue skies the thought of departing early and having brunch instead appealed greatly. So I was first to leave the hotel, hitting the road at 7:50am with the temperate hovering around freezing and the bike’s dash flashing me the temperature in Fahrenheit to warn me of the possibility of ice. But crisp mornings like this show the world at its best and this morning was no exception, with mist rising from the glass-calm waters of the inlets at the roadside as I rode through beams of pale orange sunshine between the trees on the other side of the road. 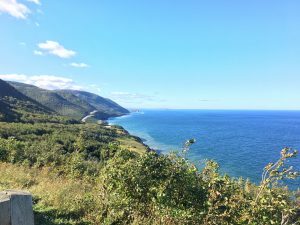 I headed back the way we’d come yesterday, intending to ride the Cabot Trail in a clockwise direction. 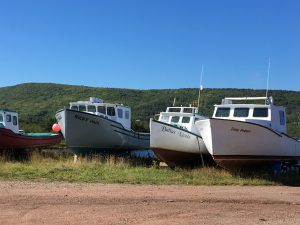 First thing I needed to attend to was fuel, so I went to the Esso garage in Baddeck that I’d passed yesterday, only it was closed. No problem, there was another petrol station in town on the GPS map, only that didn’t exist. Ok, time to get back on the main road, and there was a fully-functioning petrol station almost immediately. With a full tank of fuel I was now totally content, and that mood would remain with me the whole day. 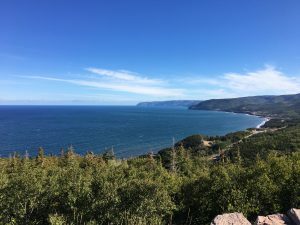 I rode north west, over Hunters Mountain and via Middle River to Margaree Forks, where the Cabot Trail heads due north, joining the coast at Margaree Harbour. 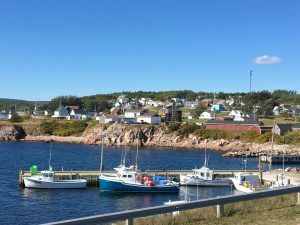 From here it hugs the coast for some distance, affording spectacular views of a deep azure-blue ocean dotted here and there with white horses as the waves gently make there was ashore. This was quite a contrast to yesterday when it was very windy and decidedly choppy. 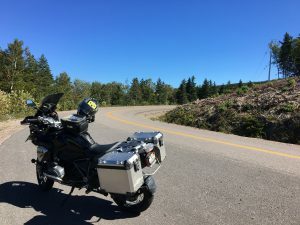 The ocean here is known for whales and there are many excursion options out to see them, but we don’t have time on this trip, which meant I kept scanning the ocean whilst riding just on the off-chance I got to see one. I didn’t, but the white horses kept me alert, as each time one appeared I’d be scanning looking for signs of the ocean giants. Just before Pleasant Bay were the road-works and dirt section we’d ridden yesterday, only this time my confidence was higher and it didn’t pose even the slightest problem. I had planned to stop for brunch at the Rusty Anchor, where we stopped yesterday lunchtime, but it was closed, so I continued on. 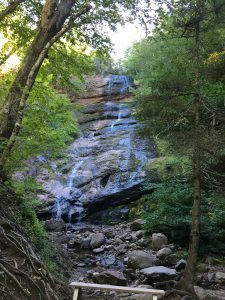 After a short while I reached a turn-off for the Beulach Ban falls, so took this and rode the short dirt-road to the trailhead, where a short walk took me to the falls. These were not very impressive, but as the sign close by had a poem to them, it would be churlish not to repeat it here. From here I returned the main road and fueled up at Cape North, where I met up with Jeremy who was also riding alone, having his own adventures. 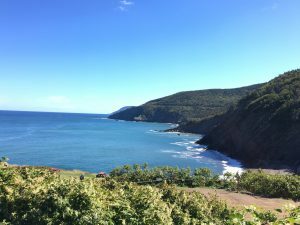 We decided to ride up to the Bay of St Lawrence and on via the dirt road to Meat Cove together and this proved to be a really beautiful ride. On the dirt road we passed the rest of the group (minus Dean) heading the other way, and once at Meat Cove we stopped at the café for lunch – another excellent bowl of seafood chowder! After returning to the main road we separated again, each of us happy to spend time alone exploring this beautiful island. 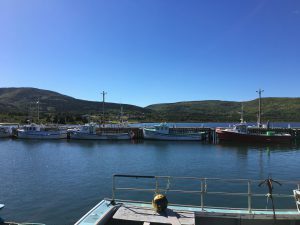 I took the road to the port at Dingwall, then the little coast road to White Point, which proved to be a real highlight, with great riding and some wonderful little harbours, with brightly coloured fishing boats moored up, surrounded by hundreds of old lobster cages. Eventually I returned to the main road once more and made my way to the place we’d had breakfast at yesterday, the Clucking Hen. 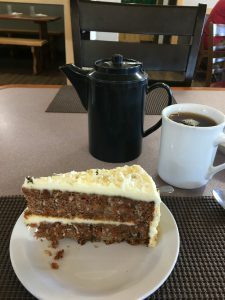 When we were there, I’d spied the home-baked carrot cake and the thought of this had kept me determined to head here on the way back to the hotel! It proved to be just as delicious as I’d hoped, and with my hunger once again satiated, I completed the circuit back to the Cabot Shores Wilderness lodge and my cabin home-from-home. With a couple of hours free I was able to look at some of the photos and update this story, but can’t help feel that I can’t do days like today justice in words and pictures. Some days are days that really make me feel so very fortunate. This was one of those days – just spectacularly enjoyable! 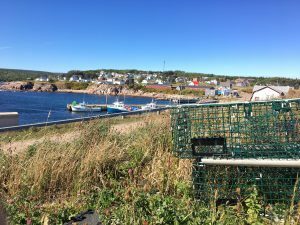 And tonight, we’re heading out for more lobster! Tonight wasn’t just lobster, though, it was also all-you-can-eat mussels (I ate a LOT!) and even a taste of snow-crab. And Lobster, of course. All delicious too! Hi Paul. Really enjoying hearing about the trip and seeing some of the images (amazing – better for you). Thanks for sharing. 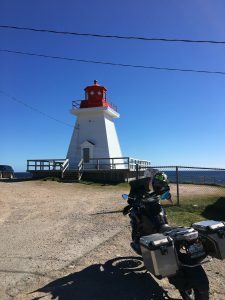 Next Next post: Day 11: Monday 24th September – to Halifax, N.S.